Hi, I am interested in your 1967 Chevrolet Corvette (stock #5069-CHA) listed on Autotrader for $82,995. I'd like to get more information about this vehicle and confirm its availability. The way to an enthusiasts heart is with a numbers-matching big block Sting Ray. 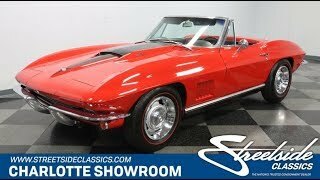 So we already know you love this 1967 Chevrolet Corvette Convertible. But dont forget to take the time to look at all the details from the great color combo to the four-on-the-floor that let you know this low-mileage classic is desire on wheels. A Corvette finished in red is so iconic that they write songs about it, but this one knows how to command even more attention. This has a more recent application of red, and it has a ton of gloss and a great clearcoat shine. So the sunshine really loves this Sting Ray. And they even got the details right, like the redline tires that tell you someone has carefully loved this classic. In fact, its a two-owner car coming off of long-term ownership since 1971. So its been treated like a family member, which is how you get a cherished car that has averaged under 960 miles annually. The chrome is bright, the badging is complete, and the panels fit nicely this is a well-respected C2. While youll love accessories like the color-matched hardtop, we bet youll use the black folding roof plenty. Thats because it goes so nicely with the black stinger hood. But your absolute favorite way to drive with be with the roof off after all, thats what a convertible is all about. So you get a deep and dark black inside that looks great against the red and matches the intimidation of the hood. This interior gets the vintage look correct, right down to the vertical AM/FM radio. So you get all the best drivers features, like the low-back bucket seats, thin wood-rimmed steering wheel, a full set of gauges with large speedo and tach, and a bright stick shift calling out for your right hand from within the darkness. Under the hood is what we all love to see big block power. It makes collectors weak in the knees when its not only presented properly, but also when its the original numbers-matching powerhouse. The 427 cubic-inch V8 inhales deeply from a four-barrel carburetor, and it exhales with a that wonderful big block authority out of the dual exhaust. Youll love the full control that the four-speed manual gives you over this power and thunderous soundtrack. And control is a central theme to the Corvette. Thats why you get features not found in many other 60s machines like four-wheel disc brakes and a fully-independent suspension. A cherished car like this also comes with great paperwork, including the factory buildsheet, original bill of sale, owners manual, and maintenance receipts. This is the kind of sports car classic were all looking for, and theres only one up for grabs. Dont miss out, call today!